Assemblymen Michael Montesano (R,I,C - Glen Head), Edward Ra (R,I,C - Franklin Square), and Al Graf (R,I,C - Holbrook) at a testing/Common Core forum at SUNY Old Westbury this past October. January 27, 2014 -- On Thursday, Republicans in the state Assembly officially released a proposal that would slow down the implementation of the Common Core learning standards and require a review of the state assessments that have upended public education in New York State. The plan, known as Achieving Pupil Preparedness and Learning Excellence (APPLE), also calls for state reimbursement of costs incurred by school districts for testing and teacher evaluation mandates, as well as limits on the use of student data. The proposal was developed after months of hearings held by the Minority Conference during which parents and educators were offered the opportunity to offer their thoughts on the implementation of the Common Core learning standards, and the state's standardized testing requirements. Noah Blumenthal of Sea Cliff, spoke on behalf of the North Shore Parents Action Committee (NSPAC) at a hearing that was held at SUNY Old Westbury this past October. Assemblymen Edward Ra (R,I,C - Franklin Square), and Michael Montesano (R, I, C, - Glen Head) both of whom represent areas of the North Shore School District, have endorsed the proposal. "In 2014, our first priority should be providing the best education possible for our children," said Mr. Ra, who serves on the Education Committee. "Reforming Common Core is crucial to accomplishing that." "Clearly, the implementation and high-stakes testing laid out in Common Core's roll-out have caused more problems than they have solved," said Mr. Montesano. 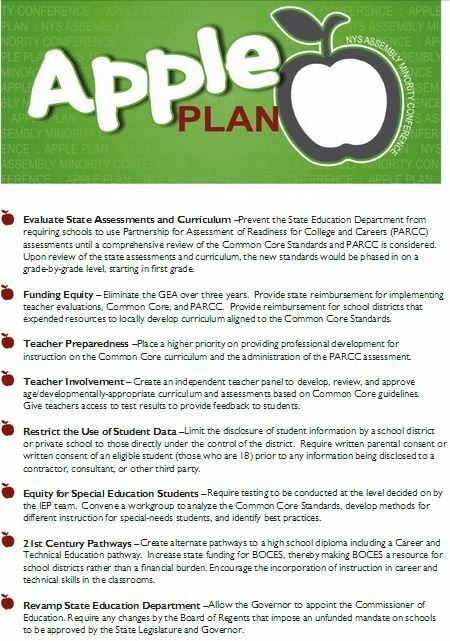 "The APPLE Plan takes into consideration the input from parents and teachers that went missing in the implementation of Common Core and creates a pathway to successfully educate our children and provide them with the tools they need to succeed."